Please accept my blessings. I beg to thank you for your letter dated 30th April, 1970, and I have noted the contents carefully. I have also received the list of all the cities and towns in England, and thank you very much. It is my desire that you open a center in each and every one of these places, and that will help to fulfill the prophecy of Lord Caitanya that His Holy Name will be sung in every city and town all over the globe. I am so glad to learn that things are going on nicely in our London Temple. The most important point in this letter is second time initiation of some of the devotees, specifically Jaya Hari Das Brahmacari, Jyotirmayidevi Dasi, and Mandakinidevi Dasi. So I am sending herewith the sanctified Gayatri Mantra Tape and papers for holding the ceremony, as well as a sacred thread and special instructions for the devotees with the Gayatri Mantra. Now what we have to do is to hold the Gayatri Mantra ceremony according to the instruction paper, then at the end teach Jaya Hari personally how to count on the finger divisions. Then play the Gayatri Mantra tape for him, and let him repeat the Mantras along with my vibration, word-to-word, and then hang the Sacred Thread on his neck as usual. The girls don't require Sacred Thread, as you know, but they simply can responsively chant the Gayatri Mantras. In each individual case the instruction should be given and the mantra replayed. This Gayatri Mantra function should be held amongst the devotees only. While Trivikrama is coming here, the books which I have left in London--one large Bhagavatam, one small Bhakti-Rasamrta Sindhu, and maybe other books--he may bring here. So I am awaiting his arrival along with the books very soon. Please offer my blessings to Srimati Yamuna Dasi, and to all the other devotees there in London. Please accept my blessings. I beg to acknowledge receipt of your letter dated 3rd May, 1970, and beg to thank you very much for your kind sentiments. Yes, if it is any credit for me, that is what you have written that I tried to give aural reception to the words of my Spiritual Master, Bhaktisiddhanta Sarasvati Goswami Maharaja, and thus I tried to engage my tongue in repeating the same words without any change. Actually I am the most unworthy servant of His Divine Grace because I delayed to execute His order by so many years. But it was better I began late than never, and therefore He has kindly sent to me so many young hearts to cooperate with me in this great Movement. Please therefore continue your good cooperation, and I am sure great things will happen without delay. Regarding New Vrndavana activities, I think whatever you are doing is approved by me. As you are acting very sincerely in Krsna Consciousness, Krsna is dictating from within your heart, so there is nothing to be disapproved. Regarding purchasing the property next to the schoolhouse, I have taken information from Devananda that this land is not directly attached to our present property, but the only advantage is that it is on the roadside, and we can engage it in so many ways. So if Krsna is giving us the chance to purchase it, let us take advantage of the opportunity. But from strategic point of view, as we are expecting to purchase Mr. Snyder's property next year, he may be still tighter. But the advantage of being on the roadside in future will be of great use, there is no doubt of it. Here in L.A. we are decorating the Temple room very nicely. As I am inviting everyone to come here and see, I think you should also once come here and see the Temple room so that you can erect in New Vrndavana in the same style. It is not very difficult, but it looks very gorgeous. Please accept my blessings. I hope everything is going on well in your center. 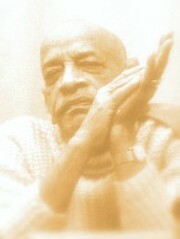 As each and every ISKCON Center is my life and soul for preaching this movement, I hope you are doing your best to conduct the regular routine duties of the Temple--chanting regularly the beads, observing the restrictive regulations, taking Sankirtana Party to the streets, and selling our magazines and books. Nos at the present moment, I am concentrating my energy in this Los Angeles Center as ideal for all other centers in respect of Deity worship, Arati, Kirtana and other necessary paraphernalia. As I have curtailed my moving program, I wish that you may come here at your convenience and stay here for a few days and see personally how things are going on, and by meeting with me personally for necessary instruction, I hope simultaneously in all Centers that activities will be of the same standard. Hope this will meet you in good health, and more when we meet. Please accept my blessings. I beg to acknowledge receipt of your encouraging letter, dated 8th April, 1970, and I am so happy to note your steady enthusiasm to work harder in Krsna's service. So this enthusiasm is very good sign, and if you continue to become more and more enthusiastic to be always strictly engaged in devotional service while observing carefully the rules and regulations, Krsna will surely bestow upon you full success in Krsna Consciousness and thus your life will be happy and successful. Regarding the color of Balaramaji, He is colored like milk white with little bluish tint and rosy luster. Our idea of whiteness is of the milk foam. Regarding whether ivory is offerable to Krsna, yes, ivory is pure. Although it is a bone of an animal, still it is as pure as the conchshell which is also the bone of an animal. The six armed form which Lord Caitanya disclosed to Sarvabhauma Bhattacarya had two hands of Lord Ramacandra, two hands of Krsna and two hands of Lord Caitanya. Perhaps you have seen the picture in our New York temple which was brought from India by Kirtanananda Swami. Your question why Lord Siva was ordered to appear as Sankaracarya and teach the Mayavada philosophy to turn the people to atheism and thus increase the population, that nobody can understand. If Krsna desired Lord Siva to do like that, so he had some plan which we need not understand. He is the Supreme Lord, and He is maintaining the huge universal affairs, so how does He do things and for what purpose He does them, it is very difficult to understand. Just like He planned the battle of Kuruksetra and He induced His friend, a great devotee, Arjuna, to kill. So why does He plan to make others atheist, it is known to him. Our business is to glorify Him always, either He plans to dance with the Gopis, or He makes a plan to kill others on the battlefield of Kuruksetra, or He plans to do something which is not very good from materialistic point of view. Our only business is to remain steadfast devotee to Krsna in all conditions. That is the instruction given in Siksastaka, wherein it is said, ``My Lord, whatever You like You can do, but unconditionally You are my only object of worship.'' That is pure devotion. I am so glad to learn that there are two very nice women devotees now coming to the Temple regularly, and please offer them by blessings for advancing in Krsna Consciousness. Take care of them nicely so that they may learn our program of Krsna Conscious life very nicely. Let them chant regularly and follow the four basic principles and they will become firm in their faith in Krsna. If you recommend, I shall initiate them, so you can send sets of new beads with their letters and some donation for the book fund. The standard form is that the initiate collects some alms by begging and offers it to the Spiritual Master as daksina or presentation. That is nice if you get that land in Miami and open a center there. You are intelligent and eager devotee, ready to spread Lord Krsna's teachings, so do it. That will be very good, it is an excellent proposal. So as you say the deep Southern part of this country is virtually untouched, but I think Kirtanananda Maharaja has gone to several places there, and he has been very successful. So try to attract the students, they are our great future hope, and they will take up this matter very quickly because the students are not very contaminated. The first two lines of the song ``Haraye Namah Krsna'' were sung by Lord Caitanya and His followers, but the other lines of song were composed later on by Srila Narottama Das Thakura. Yes, fix up your mind on Krsna and everything will come out nice--be sure of this fact. Study scripture, always chant, love Krsna--and that is the success of life. Please accept my blessings. I beg to acknowledge receipt of your letter dated 28th April, 1970, and the report of our Sankirtana Movement in London is very much encouraging. I think each couple of our students may try to open a branch in England. Our first branch of London Yatra was opened by Mukunda, Gurudasa, and Syamasundara. and their wives. They tried very hard, and now our London Temple is nicely situated. Similarly many other Temples can be opened in places like Amsterdam, Birmingham, Liverpool, Manchester, etc. I have received report from Tamala that preaching in Paris is going nicely. In one day they recruited about 14 devotees simply by requesting who will join this Krsna Consciousness movement. So you all also recruit members, English boys and girls, in that way. Our Movement is a declaration of war against Maya, that you can understand very well, so we have to recruit many fighting soldiers--so do it vigorously. I am glad to learn that the children are feeling very well in open atmosphere, so let them enjoy life for some time. George has rendered some valuable service, so Syamasundara. is trying to do some good to him. This is our duty, anyone who has rendered a little service to Krsna should be given all facilities to take it up seriously. Regarding your question, Yes, Krsna is always increasing in so many ways, so there is no question of decrease. The verse in question stating that Krsna is devoid of increase and decrease is from Srimad-Bhagavatam and it is given with specific reference to the devotee. The purport is that if Krsna gives himself to any one of His devotees, although He is Purna or the Complete Whole, still there is no decrease in Him. Similarly we may give to Krsna everything, but still He is not increased. Please offer my blessings to all the boys and girls there. I hope this will meet you in good health. Please accept my blessings. I am so glad to receive your letter dated April 1970, and I am so pleased to learn that you are chanting Mahamantra Hare Krishna. It is very much pleasing that you acknowledge the gifts of Krishna. Krishna is the Supreme Father, and all living entities in all different forms are His sons. He is maintaining everyone. He is supplying food, clothing, shelter to each one of His sons, but those who are Krishna Conscious, they admit the gifts of the Father, and thus try to please the Supreme Father by service. Unfortunately, the demons do not even acknowledge the gifts from Krishna, and they talk nonsense that there is no God, God is dead, I am God, and similar things. So as you are acknowledging your obligation to Krishna, as well as chanting the Hare Krishna Mantra, so I hope Krishna will give you more facilities so that you can become perfect in this very life. It is very easy to achieve such success simply by chanting the Hare Krishna Mantra, and let us not miss this great opportunity. Please accept my blessings. I beg to acknowledge receipt of your letter dated 28th April, 1970, along with a note from a boy in Spain. I have replied the boy, and the letter is enclosed herewith, please forward it to him. I am very glad to learn that you have the Prahlada pictures in your safe custody because I want to print up many small books with text accompanied by illustrations, and the first one may be of Prahlada Maharaja. Sometime ago you wrote me that you wanted some new topics for writing subjects, so I think you can begin by compiling information from my past lectures on Prahlada Maharaja, then add the pictures and print it. Then you can do many other such books like this. Some other books may be about Dhruva Maharaja, Ajamila, etc., and I am sure these stories with their very significant purports will make very successful books, and they can be very easily sold. So if you can begin on this project and arrange everything carefully, that will be very nice. Please accept my blessings. I am in due receipt of your letter dated 26 April, 1970, and I am so pleased to note the contents which are exactly befitting your name Tamala. Perhaps you know Tamala is a nice tree in Vrndavana, and because the color of the tree exactly resembles that of Krsna, therefore Srimati Radharani always used to take rest underneath the Tamala tree when she was feeling separation from Krsna. So for European activities, I have sent you there, and for its nice organization I am counting upon you very much. You have so kindly written to say, ``Please order me in any way Your Grace desires, everything I have including myself belongs to You, and Your Grace may do with me as You wish.'' So it is my desire that in Europe you will kindly occasionally visit the three countries--England, France, and Germany--and see that the things are going very nicely. In England your suggestion to open a few other Temples in big cities like Birmingham, Manchester, and Liverpool, is very much welcome. For constructing Temples in England, especially in London, I have got very good support from a very rich man in India. Not only he, but also many others will be ready to pay for our construction such Temples, but I want the Temples should be constructed by the local natives--that is our success. If I bring money from India and construct a Temple here in a Western country, that is not very creditable. Now this Temple of Los Angeles is completely undertaken by your countrymen and that is a good credit for me. Anyway, if I go to India for some days, I am sure I shall be able to collect a considerable amount of money for this purpose, but I wish that people from this part of the world should be sympathetic with my movement. This means good organization to convince the people of the Western countries that we are doing something which is very, very much beneficial for everyone, and especially for this part of the world. Regarding a place in Paris, you write to say that there is accommodation, but you are in want of money. If this is a fact, then immediately find out a nice place for our Paris center, and if you let me know how much you require, then I may try for it. But I am very much hopeful from your statement that in Paris we have got very good prospect of organizing this movement. Simply by your request only so many young boys and girls joined--this is a very good sign. I have information from reliable sources that in France this Krsna Consciousness Movement has very good chance. So far translating our literatures, if you simply send the matter, our press will immediately give you so many books. You can print books in small sizes and distribute them profusely. Small books like ``Easy Journey to Other Planets'' and ``Isopanisad'' will be very quickly sold more than the larger volumes of TLC and Srimad-Bhagavatam. So if Suridas and Umapati engage themselves five hours for translating work, there will be no difficulty to publish our French language books immediately. So arrange for this. I have received one copy of the latest French BTG, published from Montreal. It is printed in our ISKCON Press in Boston, and they have done it very nicely. If for the present this BTG published from Montreal can be useful? I am sending by separate airmail one copy which you can examine, and if you think they are useful for your purpose, you can immediately ask them to send you as many copies as you need. Your suggestion for Murari's opening a center at Amsterdam is very much welcome. His wife, Lilavati is very intelligent and both of them can do the preaching work very diligently in that place, so try to give effect to this proposal. Regarding this Temple, actually it is simply Krsna's grace that we have such a nice place very suitably arranged for our all purposes. Both the devotees and myself are living very comfortably, and the Temple is in the center between us. The kitchen is very nice and the frontage with a small garden space, as well as sufficient place for parking, on the junction of very important roads--all these facilities make the position of this building unique. Besides that, the banks, stores, laundry, medical house, everything is within easy reach, so we must consider this as Krsna's gift. Regarding the appointment of Suridas to the post of president, that is a very good proposal. He is intelligent, sincere devotee, and similarly his wife is also. Regarding your question about annamoya, pranamoya, etc. Yes, they are different stages of consciousness. Different living beings are situated in different consciousness, Some are satisfied in the matter of eating and sleeping, they are on the annamoya stage. Pranamoya means those who can simply survive in the struggle for existence. Manomoya means philosophical speculation. Jnanamoya means self-realization, vijnanamoya means application of that stage in practical life, and when there is the right perfection of life that is anandamoya stage or Krsna Consciousness. So by the grace of Lord Caitanya, in this age our movement is giving directly the anandamoya stage, and anyone can visit our Temple and see how our students are in blissful life. Naturally they are in jolly mood by chanting, dancing, and taking Prasadam. Your regular chanting of Mahamantra and reading of books will keep you always fit for pushing on this movement. This formula should be rigidly followed by everyone of us. In conclusion I may inform you that Acyutananda has given publicity in an important newspaper that next year I am going to India with forty students, so for the next year we have got sufficient margin of time--eight months--so what do you think? Shall we be able to have our World Sankirtana by that time? That will be very nice. All our selected students like yourself, Hamsaduta, Mukunda, Syamasundara., Umapati, etc. along with their wives, and some of the students from here may join, then we can go to India via Africa, and then after a few days in India, we can come back via Japan, So you have to consult over this matter also because it is already advertised in India. I have also just received the second copy of this letter sent by you. Hope this will meet you in good health. Please offer my blessings to Umapati and his new wife Ilavati Dasi, and to all the other boys and girls there in Paris center. Please accept my blessings. I beg to acknowledge receipt of your letter dated 26th April, 1970. Regarding printing KRSNA book in Japan because the printing details are difficult here in this country, that was my former decision. In the beginning I decided like that. Regarding NOD, I am sending herewith the dedication as desired by you. The program of hardbound books to be printed in Japan, and softbound printed on our own press is a nice suggestion. So far printing is concerned, I have just received the French BTG, and it is very nicely done, so convey my thanks to Uddhava and Advaita especially. In this way if we can print on our own press, it will be very nice. Regarding travelling, a Sannyasi's name is Parivrajakacarya, that is the beginning of Sannyasa. In the beginning one is ordered not to stay more than three days at a place, but at the Paramahamsa stage, one can stop moving, but that is not compulsory. So I have made my headquarters at L.A., that is a fact, still I may go in an emergency outside (not ordinarily) for a few days, and then come back to my headquarters. There is a gap of some transcriptions--tapes numbers 12 through 16, KRSNA, so please get them done. I shall be slow in making further tapes till I get them back. Please give this instruction to the editors. Please accept my blessings. I beg to acknowledge receipt of your letter dated 21st April, 1970. Acyutananda has written me that he will arrange for your visa for two years at least, but I learn that you have not heard anything from him til now. So unless you are assured that your visa has been made for at least two years, and he has got his own apartment, don't start. It is not required to take permission from Madhava Maharaja to stay at his place. It is not our business to become anymore burden to him. I have already sent Acyutananda money for our own land, so first we must have our own land or apartment, then our devotees can go there. On the whole, he must first of all arrange for staying somewhere in our own place, otherwise it will be very difficult because India is very overpopulated, especially Calcutta. Regarding your questions how to offer respects to Sannyasis. Every Sannyasi, even if you see a Mayavadi Sannyasi, offer him your respects--there will be no harm. As you have observed we shall follow Lord Caitanya's instruction that we give all due respects to others regarding their position, but there is no need of always associating with each of them. Even if one is Vaisnava, but not of good character, we can give him the Vaisnava respect, but we cannot associate with him. Regarding how to act when there is a choice of either attending Aratrik ceremony without bathing first or bathing and thus missing attendance at the Aratrik ceremony, the answer is that the rules should be followed as far as possible. If it becomes necessary, simply wash your feet, and when possible also wash the face, head, hands, and rinse mouth with water. When you will go to India, most probably you will have to go to Bombay, and how you will have to go to Bombay that I shall let you know later. I beg to thank you for your nice appreciation of our disciplic succession of Vaisnava Acaryas. This is the right understanding of the Spiritual Masters that they are glorious by simply delivering the transcendental message of Krsna as it is.